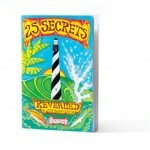 Kevin McCabe’s recipe for macaroni salad in 25 Secrets Revealed: A Culinary Tour adds a coastal twist with albacore tuna. Cook, rinse, and drain the macaroni. Let cool. Mix everything together in a big chilled bowl. If needed, add more mayonnaise and vinegar to keep it from getting dry. Serve ice cold and garnish with paprika and parsley leaves. 25 Secrets Revealed: A Culinary Tour can be purchased by contacting Kevin McCabe at kmbythesea@charter.net or (252) 995-4788.